The Yiga Clan (イーガ団, Yiga Team) is a Sheikah clan of assassins in The Legend of Zelda: Breath of the Wild. Led by Master Kohga, the Yiga Clan is a group of assassins who steal information and resources from the Gerudo tribe. Unlike other Sheikah they sided with Calamity Ganon and try to hunt down the hero. It mainly consists of Yiga Footsoldiers and Yiga Blademasters. Some members even disguise themselves as travelers, who try to get the attention of Link. They usually walk around and wave to get Links attention, but some members also try to fake cry and others who appear out of thin air. If Link talks to one of them, the try to sell Link food based items or try starting up a conversation with him. If Link refuses to talk or buy, or when Link actually buys what the person is selling, they will reveal themselves and with confront Link with their weaponry. The clans logo is just the Shekiahs, but upside down. The clan is obsessed with Mighty Bananas and any member will stop fighting Link and will get distracted by the food. The Yiga Footsoldiers serve as the inspiration for a Mii Swordfighter costume in Super Smash Bros. Ultimate. 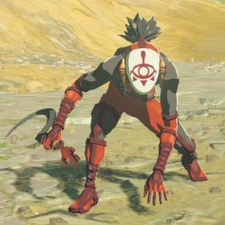 The design of their sword is based of off the Vicious Sickle, a weapon in Breath of the Wild that the Yiga Footsoldiers may have. This page was last edited on January 28, 2019, at 01:45.